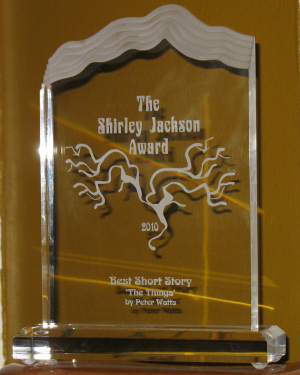 The Shirley Jackson Award winners were announced yesterday during a ceremony at Readercon. Among the award-winning works was "The Things" by Peter Watts, which we published in the January 2010 issue of Clarkesworld Magazine. [text and audio] All of us at Clarkesworld are very happy for Peter and offer him our congratulations and the best of luck next month when we find out whether or not he wins a Hugo Award for the same story. It’s not easy to photograph lucite. The Year’s Best Science Fiction: Twenty-Eighth Annual Collection, Gardner Dozois ed. The Best Science Fiction and Fantasy of the Year: Volume 5, Jonathan Strahan ed. The Year’s Best Science Fiction and Fantasy, 2011 Edition, Rich Horton ed. The Year’s Best Dark Fantasy and Horror, 2011 Edition, Paula Guran ed. The Best Horror of the Year Volume 3, Ellen Datlow ed. 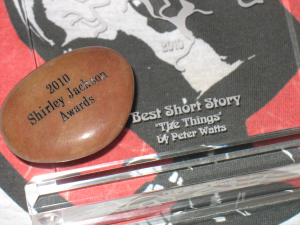 The nominees for the Shirley Jackson Awards have been announced. Clarkesworld is well-represented in the short story category by Jeff VanderMeer and Carrie Laben. Congratulations to them and all the other nominees! See the other categories HERE.